Our Extended Southeast Atlantic Forest Tour is similar to our Southeast Atlantic Forest Tour but adds a three-day visit to Guapi Assu (REGUA) Reserve and the drier habitat around Sumidouro north of Rio de Janeiro. This tour is designed to see as many endemic birds in the remaining remnant Atlantic Forest biome as possible. The tour begins with airport pickup in Curitiba. Participants are transferred to the coastal town of Guaraquecaba with a birding stop en route to look for the endangered Parana Antwren. The entire next day is spent in coastal Atlantic Forest at nearby Salto Morado Natural Reserve. This day is followed by a full day boat trip into the estuaries, mangroves, and coastal forest of Superagui National Park. From there the group transfers to Intervales State Park with a birding stop en route at Botelho State Park. Three full days are then spent birding Intervales, considered by many birding experts as the best birding place in all of southeastern Brazil. From Intervales the tour continues to the coastal resort town of Ubatuba for a two night stay. 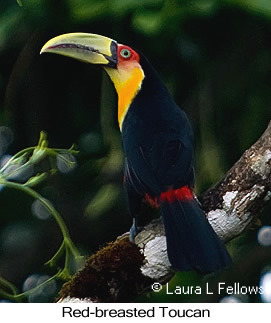 At Ubatuba visits to coastal forest and hummingbird feeders will produce many new birds. The transfer from Ubatuba to Itatiaia National Park will be via Pereque, where the endangered Black-hooded Antwren will be sought out. The following two full days will be spent birding Itatiaia National Park, with one day in the lowlands and one day in the highlands. After breakfast in Itatiaia the group will transfer to Guapi Assu (REGUA), arriving mid-day. Time will be available to view hummingbird feeders at the lodge and birding nearby wetlands. Two full days will be spent there, one birding the Waterfall Trail and the other visiting nearby Pico da Caledonia highlands. The last day will be spent birding the Carmo/Sumidouro area before returning to Rio de Janeiro for evening flights home.